Picture courtesy of Pacific Art Glass. Dichroic literally means "two colors" as shown in the sample here. 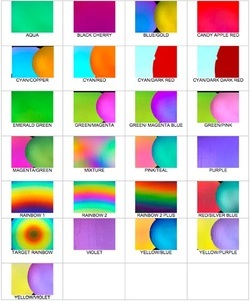 Dichroic glass has the unusual property of reflecting one color while transmitting another color. There is a color shift depending on what angle you view it from. When the coating is put on clear glass, you see both colors. When the coating is put on black glass, you see only the reflected color which is the one shown to the right in the picture. It exhibits a shimmering metallic iridescence. Dichroic glass coatings are applied in an ultra-clean environment using sophisticated multi-million-dollar equipment. The process was created for the aerospace industry. A sheet of dichroic is one of the most expensive glasses made today. Microscopically-thin layers of rare metal oxides (magnesium, silicon, titanium) are vaporized by an electron beam onto the art glass in a vacuum chamber. Some colors have as many as 30 layers of these materials, yet the thickness of the total coating is approximately 35 millionths of an inch. The coating that is created is very similar to a gemstone, however dichroic glass is better because is actually changes colors depending on the view. In some designs, we use patterned dichroic glass, like the one shown here. These are beautiful after they are fired in a kiln. They create interest in the jewelry piece. Starfire glass is used in the faceted dichroic glass jewelry Classy Creations makes. Many times a design will call for a transparent or a translucent glass. 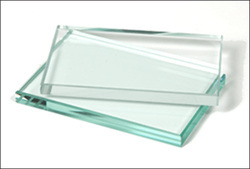 This type of glass comes in many colors and does not change colors like dichroic glass. Art glass today comes in many forms. It can be purchased as granules, called frit. 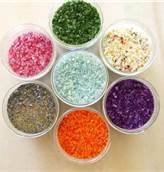 Frit comes in various sizes from very fine to coarse frit. There are large sheets of glass and small pieces called "buffalo chips". The variety available today gives the glass artist lots of materials to work with. Click here to go to the next page on "Techniques Used".